The United Fire Brigades’ Association Nationals Drivers Challenge is held annually. This year the UFBA wanted to produce an award to recognize the ‘Top Rookie’ of the year. 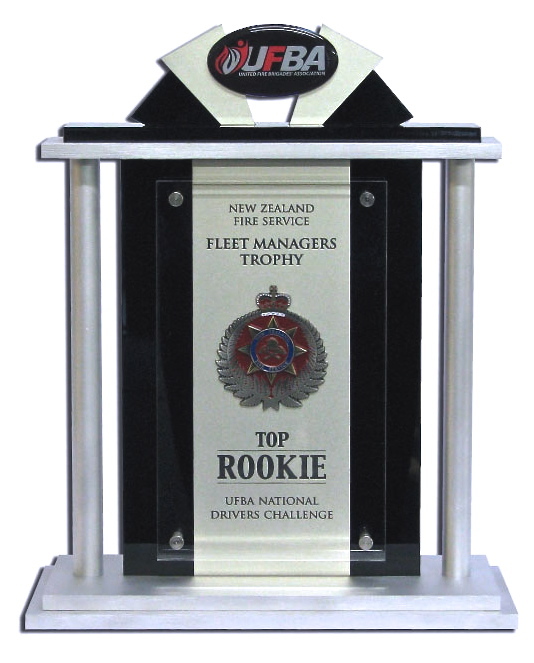 We worked closely with the Fire Service to ensure we made a custom made trophy that suited their needs. The award was made from sandblasted aluminum and black/clear acrylic with laser engraved text. It was then finished with a die pressed crest and a printed logo. The combination of the materials gave the trophy a stylish and unique look. We would like to congratulate Simon East from the Cust Volunteer Fire Brigade for being this years ‘Top Rookie’. For more information on our custom made trophies, check out our gallery or get in contact with one of our friendly staff.